Gentle repetitive movement for the agitated resident. Bright colors, texture variations for visual and tactile stimulation. Threading shoestring and buttoning buttons aid fine-motor skills. Center plastic pocket holds photo of family, friend or pet. Secures like an apron around resident's waist. Gentle repetitive movement for the agitated resident. Bright colors and texture variations provide visual and tactile stimulation; threading of shoestring and buttoning buttons aid improvement of fine-motor skills. Center plastic pocket holds photo of family, friend or pet. 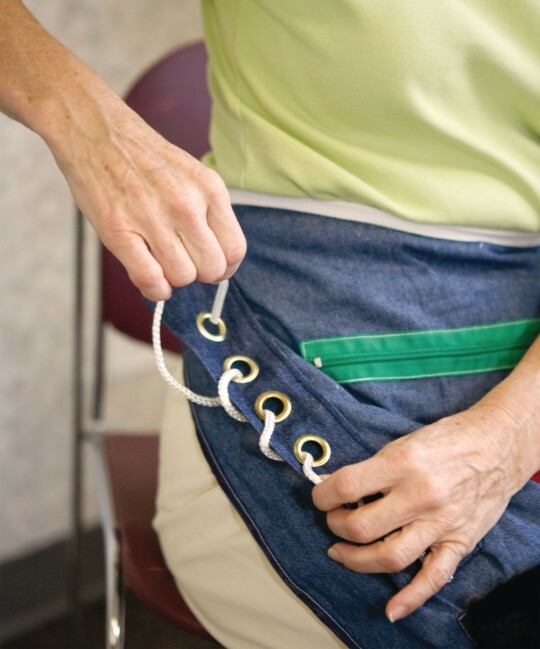 Secures like an apron around resident's waist. Machine washable. Measures 27''L X 24-1/2''W. In our skilled nursing facility these are great items for patients that have dementia. They keep the residents happy and busy. We use them to prevent falls because it keeps the resident busy doing an activity and they do not try to get up from boredom. These aprons are great for seniors with cognitive impairments. I have used them for quit some time in long term care facilities. One problem I have come across is that the buttons periodically come off but easily reassembled and the lace up part has also come off once but yet easily reassembled. The other issue is they are quit expensive. Overall I really like this product.